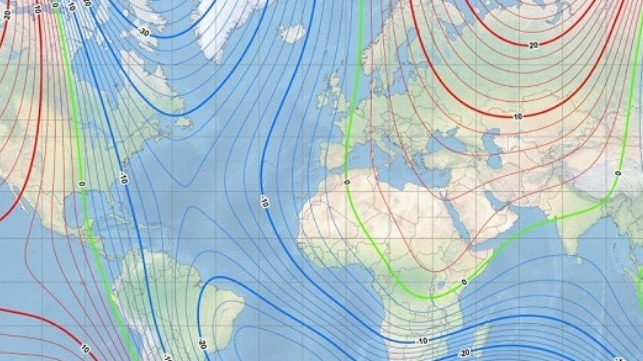 NOAA has announced that the National Centers for Environmental Information has updated the World Magnetic Model mid-cycle to reflect unexpected changes in the location of the magnetic north pole. Sir James Clark Ross first discovered the North Magnetic Pole in northern Canada in 1831. Since 1831, the pole has been moving across the Canadian Arctic towards Russia’s Siberia. The most recent survey determined that the Pole is moving approximately north-northwest at 55 kilometers (34 miles) per year. The Earth’s magnetic field evolves due to unpredictable flows in Earth’s core. The north polar region is experiencing one of these erratic changes, necessitating the update to the model. Typically, a new and updated version of the model is released every five years. With the last release in 2015, the next version was scheduled for release at the end of 2019. The out-of-cycle update before next year’s official release of the model will ensure safe navigation for military applications, commercial airlines, search and rescue operations and others operating around the North Pole. The military uses the model for undersea and aircraft navigation, parachute deployment, and more. Smartphone and consumer electronics companies also rely on the model to provide consumers with accurate compass apps, maps and GPS services. 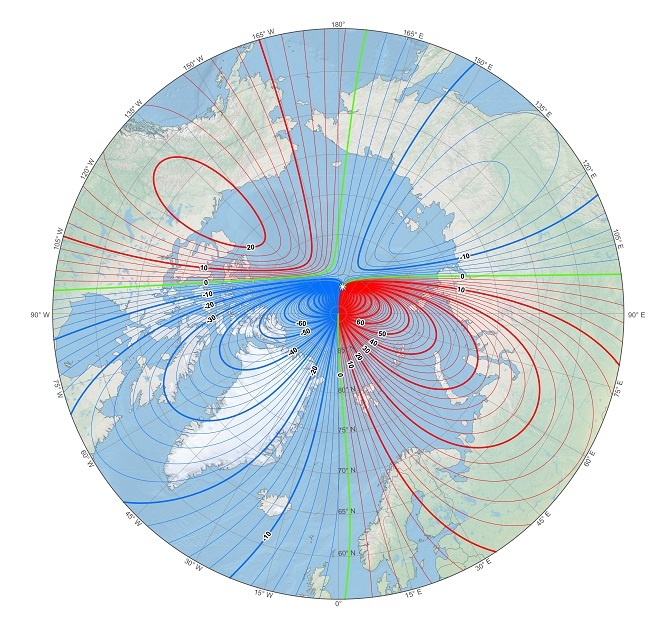 This map shows the location of the north magnetic pole (white star) and the magnetic declination (contour interval 2 degrees) at the beginning of 2019. Courtesy of NOAA NCEI/CIRES.